Yours Truly relaxing by a major body of water. I have returned from my conference where I gave a half-stunned audience my lecture The Top Six Fallacies In Statistics. But though I labored long and hard, it wasn’t all work as the picture to the right proves. There I am, relaxing by the beach. The meeting guidelines announced a “business causal” dress code, which I think you have to agree I nailed. I mean, I’m not even wearing a waistcoat. It’s nice to kick back and put on some old thing every now and then. Fifty-percent of my audience, as I say, were sympathetic, but it’s my fault the other fifty-percent weren’t. See, I gave my two favorite examples of bad statistics (linked on my Classic Posts page), which are (1) Statistics “prove” that even brief exposure to an American flag is likely to turn one into a Republican, and (2) Statistics “prove” that attendance at a Fourth of July parade turns one into a Republican. There is a minor industry of these kinds of papers, all produced by sincere academics who, after polling their friends, colleagues and neighbors and failing to discover even one of these strange creatures, ask how it is they (the strange creatures) are created. Since everything that comes into existence has a cause, some thing must be causing people to turn into Republicans. But what? I can report it isn’t brief exposure to flags nor parade attendance. More likely it’s exposure to over-confident over-egoed (yes, over-ego-ed) intellectuals who over-populate certain university departments. Incidentally, Yours Truly is not a registered Republican. He is not a registered anything (though once, many years ago, he was briefly registered as a Democrat). Anyway, my talk started on contested grounds, which would have been all right, but I happened to couple those prescient observations with several others the gist of which was that Leviathan had fallen into the bad habit of relying on evidence which accorded with its desires and not with the truth. It turned out that a good chunk of my audience belonged to a company which makes its living by selling products and services to bring firms “into compliance” with certain of our beneficent government’s many and increasing regulations. They liked the evidence which caused Leviathan to call and rely on them. This proves the maxim that capitalism is bound to fail when it becomes cozy with government (right, health insurance companies?). But I did make friends with the other half of the group, which were members of those firms which were being forced to comply and weren’t well pleased with the expensive idea. On the whole, I think a success. There were meals (a variety of aquatic life), cigars (Ashton for me), and whiskey (Maker’s Mark) with friends, entertaining talks, and quiet meetings where we planned our cabal’s next moves. Thanks very much to those who made it possible! The photo reminds me of a recent Agents of S. H. I. E. L. D. episode where one of the agents covertly landing on a beach was wearing a coat and tie. No hat though. Possibly lost it to a wayward breeze while paddling to the beach. (Forgive me, if I overstep bounds by posting about what interests me, as prompted by yours and others’ posts! I think I’ve acclimated to the web! But -perhaps- I have only reverted to an older paradigm, a half-remembered commonplace: Conversation. Can we see the presentation? Capitalism died of its own death over a 125 years ago when the richest people decided to create thrust and make sure to kill any possible competition. Capitalism as you intend it is an utopia that can’t exist because as soon as someone gain enough money/power they will use corruption to make sure to maintain/keep the condition to favor themselves. Neither government or corporation are evil. They are both necessary but there has to be a balance of power between them. It wasn’t recorded, unfortunately. I keep threatening to write it up, but I haven’t done so yet. But see tomorrow’s post. 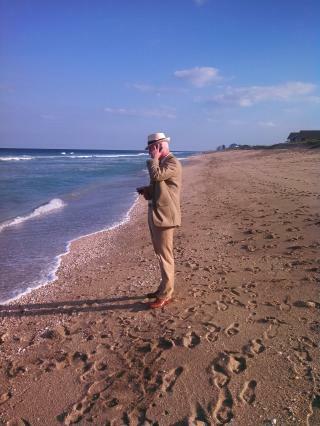 Don Jackson, free association: the beach, focus on clothing, lament for a failure to connect. Echoing. Letting the soot fall and curling about the house. @Gary: I hope my little addition (including the link to the whole poem) showed my approvalâ€¦and enhanced others’ enjoyment! Capitalism is, of course, flawed, like all works of man. However, it turns out that it is the best of the many systems that have been tried. Subsidize the poor too much and you’ll get more poor people. Excessively tax successful people and you’ll get less of them. Socialism can only work where people are ready and willing to accept and afford a large underclass, and accept that people stand little chance of becoming wealthy let alone successful. Hard capitalism died early because it didn’t work. Few people were getting rich and these rich made sure that they could keep their priveleges by preventing other people of making money. The best system is an hybrid between capitalism and socialism, where the poorer are rich enough to have a decent life and the rich wealth is still growing but not has fast. Money has to circulate to grow. It is false to believe that the rich are the main job Creator because at a certain level the rich only secure the money they don’t reinvest it. Wall Street create wealth but they do not create jobs since the action they sell don’t even go the companies (unless companies emmit new action or if the company enter the market). For example, the exchange of action from apple do not profit apple.